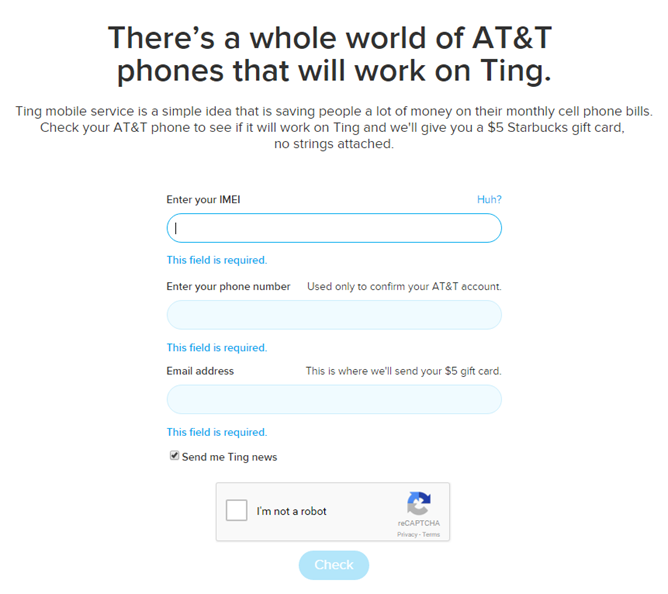 If you're an AT&T customer, you can have a free cup of coffee (or anything else from Starbucks that costs less than five dollars) on Ting. The budget-focused MVNO is offering a $5 gift card to AT&T users just for checking to see if their current phone is compatible with the service. Head to this address, enter your phone's IMEI number to check if it's compatible, enter your phone number (to make sure it's an AT&T account), then give them your email address to get your gift card. Not bad. The promotion is active today, tomorrow, and Thursday, ending at midnight Eastern on October 22nd. Signing up for the gift card doesn't obligate you to buy anything from Ting - in fact you can opt out of Ting's marketing emails even as you sign up. Of course, some people might not feel comfortable giving away their IMEI and phone number, plus an associated email address, just to get $5 worth of coffee. That's perfectly understandable. If you don't have a problem with it, most Android phones list the number under Settings>About phone>Status>IMEI information. It may take a day or two to get your free gift card - Ting's blog post says that it will come in before the end of the day on October 26th (next Monday).